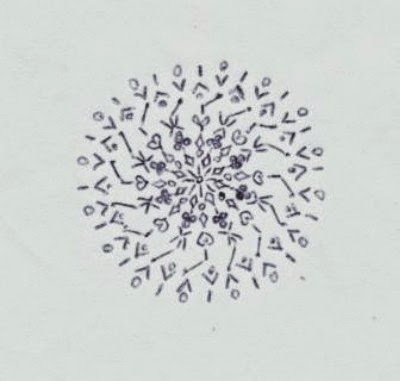 The "original" patterns I used to draw with pen and paper were all circular or "Mandala-like." To this day, they represent the majority of Alchemy Stone designs, from little to large. This photo is a scan of one of the few surviving "really old" drawings of mine, dating back some 30+ years. It was done in black ballpoint ink-- sometimes (when I could afford them) I would use "Rapidograph" pens. These round designs are not necessarily "easier" to compose, but they do lend themselves quite well to maintaining a high degree of symmetry... which tends to be a natural extension of Sacred Geometry and the patterns found in nature. I like the way I can start with 8 elements, which then become 16 elements, becoming 32, then 64, and so on. Alas, it can be surprisingly difficult to find "round" or "circular" rocks. If you walk onto your average beach, most rocks there are going to be irregular in shape. Most will not have perfectly smooth surfaces-- often they are "pitted" or cracked or have rough textures. If you have ever stood on a beach, looking for a good "skipping stone," you have a sense of what I am talking about. Very few stones "fit the bill." In general, I look for stones that are flat-ish, and they usually have a "domed" side and a "flat" side. The flat side goes on the table; the domed side gets the decoration. Since some people use Alchemy Stones as paperweights, I don't want them to go rolling away! 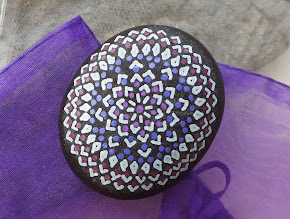 Of course, I don't expect to find perfectly round rocks to paint on-- most designs are painted on round-ish stones. Even so, I can spend several hours on the beach-- and our local beaches generally have lots of loose rocks-- and only come home with a handful of really "good" rocks to paint. The stone pictured here-- "in process" before getting its finish coat-- is about as "round" as they come. And it's one out of a really, really, really large number of not-so-round stones I picked up and didn't choose. Try it, some day, when you're on the beach. You'll be surprised by just how difficult it is to find a symmetrically round stone. I describe these Alchemy Stones as having "Mandala type" designs-- it's the closest thing I can think of. They are also the most popular style of design I make... the concentric circle repeating pattern seems to have a very broad appeal.